Don't be sad it is time to CELEBRATE. This is THE final Upcycled Awesome and everything else. I have enjoyed this feature on my blog for the last year and a half, but it is time to move on. So lets celebrate! 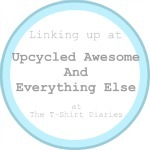 Let's post as many projects (upcycled or not) and make it and amazing celebration of our upcycling awesomeness!